Welcome to Sports Grill, home of Miami’s Best Chicken Wings! 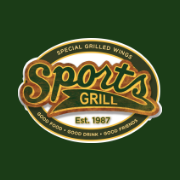 For over 30 years, Sports Grill has satisfied local appetites with reasonably priced cuisine, served in a relaxed and welcoming atmosphere. Whether you’re an avid sports fan coming to cheer your favorite team or just stopping by to enjoy some old favorites, we promise that our delicious menu and friendly staff will provide you with a dining experience you won’t forget!